We constantly change and adapt the way we talk from person to person, even though you might not realize every time it happens . When, why and how we do this depends on the person, place and our understanding of their beliefs, attitude(s) and needs. For example, there’s a good chance the way you talk to your mother-in-law and the way you talk to your buddies down at the bar are vastly different. “Catch the [Expletive] ball!” is probably something you didn’t say while watching football with the in-laws this Thanksgiving. In our last post, “5 Tips for Effective Complaint Handling”, we provided some advice on how you should approach and work through a complaints to successfully resolve and learn from it. To do that consistently you need to know the type of person who’s doing the complaining. We all know that not all our customers are alike. But that also means that your approach and response to each complaint shouldn’t be the same as well. It must always be altered depending on the type of customer you’re dealing with. One study divided customers in five identifiable types based on their different beliefs, attitudes and needs. The study not only defined each type but also explained how you should handle their complaints and the danger they potentially could cause. Your Response: It’s on you to ask questions and find out what they’re thinking and feeling so you can resolve their complaint properly. One efficient and automated option is to send customers an email with a satisfaction surveys shortly after an appointment. Potential Pitfall: They’ll take their business elsewhere without ever saying a word or giving you an explanation. The Aggressive Customer: It’s the customer we’ve all seen (and heard) before. Complete opposite of the Meek Customer, they’re always ready to assert their complaint. And there’s a good chance it’s going to get loud for a while. Your Response: Block their all out blitz by staying calm and listening respectfully. Recognize and agree that there is a problem. Then clearly explain when and how you’ll solve it. Potential Pitfall: The danger lies in trying meet their level of aggression, especially if it involves excuse-making and finger-pointing. The High Roller Customer: You might be picturing the Lamborghini in the driveway, pool in the back, always wearing sunglasses- Guy” (because I definitely am). But what actually makes them a High Roller is that they’re constantly expecting the best (service, product, results, etc) and are willing to pay for it. Unless they’re a hybrid of the Aggressive Customer they’ll be reasonable. Their main concern is results, results, results. Your Response: Be respectfully and listen intently. Determine the questions you need to ask to fully understand the cause of their problem and how you’re going to solve it. Potential Pitfall: Doesn’t care about excuses, cares about results and isn’t satisfied until they happen. The Rip-Off Customer: The classic trickster. This customer isn’t really concerned about their complaint (or your solution), their goal is to get something out of it. And your actions to correct their problem will never be good enough unless that something is free (or at least heavily discounted). Your Response: Sniff out their con and make sure they don’t lead you off your company’s standard course of action. Use numbers and hard data to explain the reasoning behind your solution. Asking “What can I do to make things right?” is a tough question for them to answer directly. Potential Pitfall: The risk is in the name. The Chronic Complainer Customer: Never content, things are never okay and something is always wrong. Everyone has a hobby and theirs is complaining. Nevertheless, they’re still your customer and even with the headaches that will come with doing it, you must acknowledge them, their complaint and find a solution. Your Response: You’re going to get frustrated, but don’t let them see it. Listen patiently, apologize sincerely and support regularly - they’ll appreciate you taking the time and effort. Once you’ve solved their problem they typically end up being great customers and even better advocates for your business. Potential Pitfall: Intense frustration and headaches both physically and for your business. Every customer and every complaint matters. Both are valuable and taking care of one helps the other. 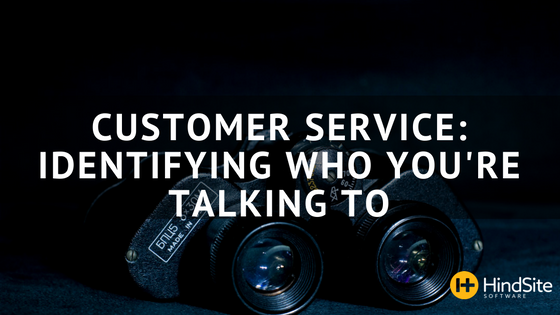 In order to do so you must be able to identify the type of customer you’re dealing with. If you don’t, the consequences could end up hurting - whether it’s a blown ear drum from an Aggressive Customer or a hit on your wallet from a High Roller taking their business (and wads of money) elsewhere.